SportsPulse: NHL insider Kevin Allen looks at who won the three-team trade that sent Matt Duchene to Ottawa and other big names that could be on the move. 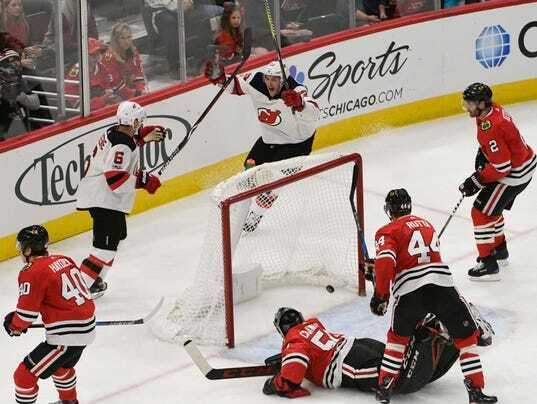 CHICAGO (AP) — Miles Wood had three goals for his first career hat trick and added an assist to help New Jersey Devils rally for a wild 7-5 win over the Chicago Blackhawks on Sunday night. Rookie Nico Hishier had a goal and two assists, and Andy Green, Taylor Hall and Brian Gibbons also scored for the Metropolitan Division-leading Devils, who won their second straight after a four-game skid (0-2-2). Keith Kinkaid stopped 39 shots.